Consumers will spend more this year on Easter thanks to a hidden cost in their grocery bill. The American Farm Bureau Federation (AFBF) released findings from its 2018 Marketbasket Survey. The survey aims to track the changes in the price of a basket of common grocery items. This includes things like bread, chicken breasts and shredded cheese, just to name a few. Cheap grain and fuel costs in 2017 saw favorable prices for many grocery items. For example, consumers enjoyed a 7% savings in bread and a 6% drop in the price of whole milk from last year. The cost of eggs is up 37% from last year! That puts the national price for a dozen eggs at $1.80. The cost of eggs is soaring this year! 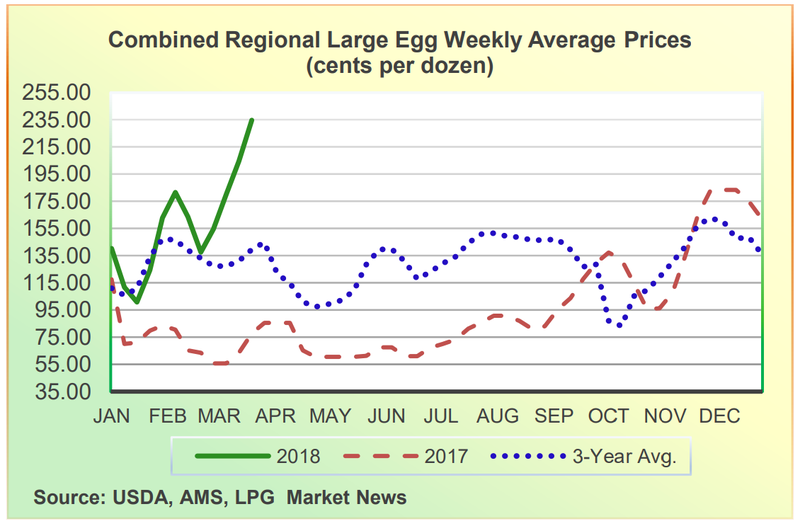 U.S. egg prices are climbing higher thanks to increased demand at home and abroad. Domestic demand for eggs is growing despite higher prices. Forecasts have Americans consuming 279 eggs per person this year. That will be the highest amount on recent record! Exports to Asia and Europe are on the rise because of decreased production from the bird flu. Attempts to stop the spread of the bird flu has hampered production. Millions of birds have been quarantined or culled to stop the spread. The U.S. saw over 40 million birds culled in 2015 during the bird flu outbreak. Since then, infections have been minimal in the U.S., leading to increased demand for our poultry and eggs. Exports of eggs are already up 50% in the last year. However, consumers don’t have to worry about prices soaring too much higher. The Department of Agriculture expects producers to increase flock size in response to higher demand. Simple supply and demand economics at work! To capture the growing demand for American eggs, consider major poultry producers like Pilgrim’s Pride Corp. (Nasdaq: PPC) or Sanderson Farms Inc. (Nasdaq: SAFM).